Description: A large, pigeon-sized body and a long, decurved bill mark this species as a type of curlew. The bill may show red at the base. The plumage has a gray-brown base color with darker patterning across the body. 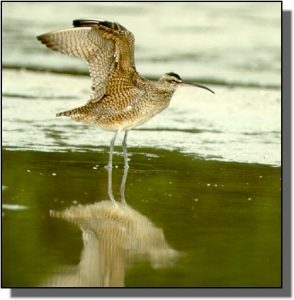 Whimbrel legs are dull gray-blue and the head has distinctive dark, lateral crown and eye stripes. Similar Species: Whimbrels are smaller and lighter colored than Long-billed Curlews, which appear richer in tone and show finer streaking on the head, rather than the bold crown and eye stripes. Godwits have straight or slightly upcurved bills. Willets are stockier with a straight bill and lack head and facial markings. Comments: A circumpolar boreal or low arctic tundra breeder, this species is found in the Great Plains primarily during spring migration. They winter along coastal areas. Mudflats, rocky shores, beaches and flooded fields provide feeding areas.